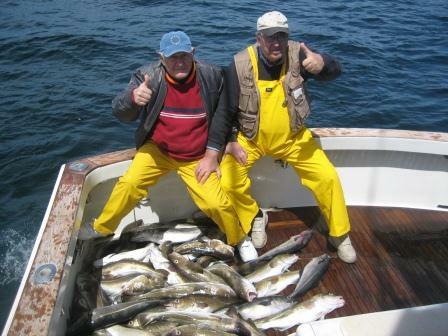 Pavel and Anatoly had an unforgettable day cod fishing charter out of Gloucester, MA aboard the Tuna Hunter. They waited out the week for a break in the weather and it proved worth the wait – sun shining, decent seas and a good cod bite – what more can one ask for! A boatful of fish? Yup, got that too. Gloucester cod fishing is in full swing – rain or shine, the cod and haddock are hitting on jigs and bait, making for full coolers and plenty of food for the family and friends. Gloucester Striped Bass fishing is heating up – fish to 35 inches have been taken both inside and outside of the harbor, so plan now for those striper charters. Call 978-407-1351 or email captain@tunahunter.com to reserve your fishing charter. Good fishing!